Therapy Chicago: Does Meditation Really Work? Does Meditation Really Work? And If It Does, Is It Right for Me? Many of my clients speak to me about their struggles with anxiety and depression. Not only do we discuss the roots of their anxiety and depression, but we also discuss possible coping skills to help reduce their anxiety and depression. One specific coping skill I ask my clients about is if they have considered meditation or mindfulness techniques. The reason I ask clients about this particular coping skill is because I have read numerous articles that show evidence that mindfulness techniques can help contribute to a decrease in both anxiety and depression, and for some, even chronic pain. The most recent article I read on meditation/mindfulness was from SELF: “What Meditation Can and Can’t Do for your Health.” This specific article answered a lot of my questions that many clients have asked me such as, “Sure, I’ll try meditation, but where is the scientific proof behind it that it actually works?” I love seeing my clients open to new coping skills, but it is important to know what the science behind meditation/mindfulness really is. Now that we are aware of what meditation is, below is a simple guide of key points from the article to help better understand what meditation can and can’t do for your health and mental health. It is just as effective as Cognitive Behavioral Therapy (CBT) and antidepressants. Mindfulness based interventions (MBIs) were generally just as effective as cognitive behavioral therapy (CBT) and antidepressants based on a February 2018 meta-analysis in a Clinical Psychology Review that assessed 142 clinical trials with a total of more than 12,000 individuals with an array of mental and behavioral health conditions. Rumination and Meditation Connection. Many people who struggle with anxiety also struggle with rumination, which is the process in which your mind keeps rethinking scenarios over and over in your head. Mindfulness meditation practices can reduce rumination because instead of participating in the thoughts over and over again, you can then become an observer of the thoughts in a nonjudgmental way. Meditation and Chronic Pain. The article also discussed that people who struggle with chronic pain such as rheumatoid arthritis, fibromyalgia, and musculoskeletal pain, could also benefit from MBIs. In 2015, the British Journal of General Practice discussed a meta-analysis of 11 randomized controlled trials in which MBI did not have an effect on pain intensity, but rather on pain control. The patients still felt the pain from their medical conditions, but the patients stated they felt they coped with their pain better through MBIs. Generalizations. It is clear that there is evidence that meditation decreases anxiety, depression, and even blood pressure. However, the article also points out that meditation practices rely a lot on each individual. The researchers from this article state that many of the individuals who participated were very goal-oriented which played a big factor in the decrease of their anxiety, depression, chronic pain, stress etc. 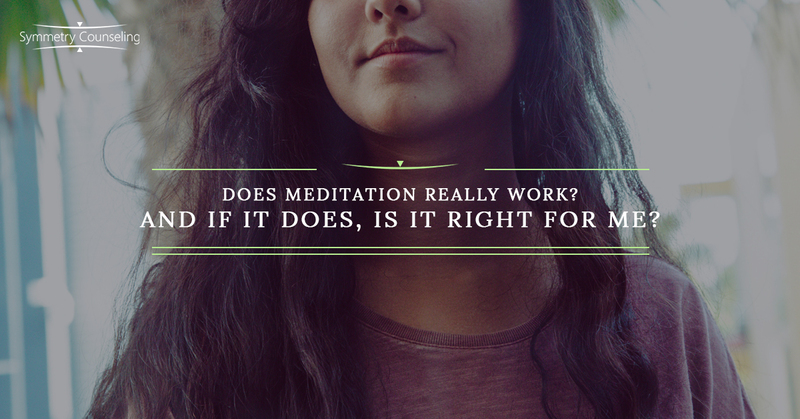 For example, someone who starts practicing meditation becomes more mindful that they should probably work out more. Through working out more, their blood pressure decreases. Thus, the meditation may be a secondary reason for the decrease in blood pressure, not the primary reason (which would be the working out). Do what works for you! That being said, if you do find meditation to be a coping skill that benefits you and helps you truly feel good, you are probably right. Practicing meditation requires openness and the goal of wishing to decrease the anxiety and depression you are feeling. If you find that practicing other forms of self-care, like walking, exercising, socializing with others, journaling, etc., keep doing those if you find them to be helpful. I always end sessions with clients by emphasizing that only they truly know what is going to help them feel better. If you are currently struggling with anxiety and/or depression, it may be a good idea to connect with one of our skilled counselors at Symmetry Counseling today. You can contact them at 312-578-9990 to set up an appointment.